The crowd gathered outside the circus. For several weeks up to the elections for State Duma, flyers and newsletters were handed out throughout Irkutsk by representatives from many different parties, primarily A Just Russia, the Communist Party, and the Liberal Democratic Party. 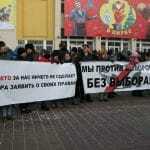 On the last working day before the elections, there was a demonstration where members of A Just Russia and the Communist party gathered together with flags and banners on the central square downtown. 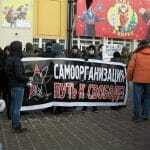 On Saturday, December 10th, Irkutsk joined many other Russian cities in protest of the recent elections. 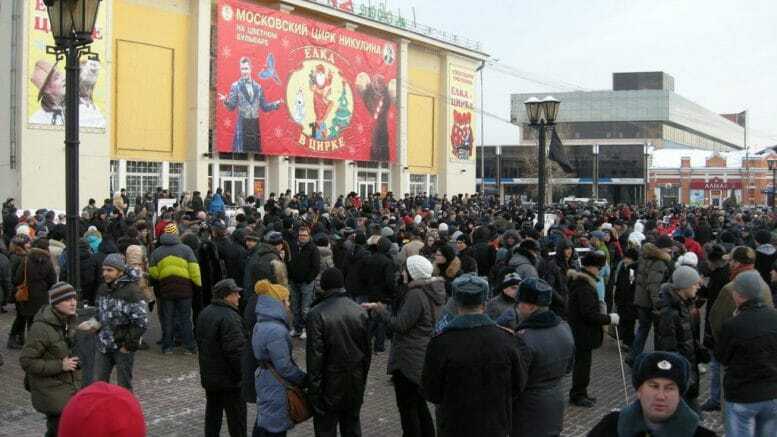 Around 500-1000 residents of Irkutsk gathered around the square near the circus to protest the election results and call for honest elections (За честные выборы!) It was a fairly tame protest, with no incidents. Many journalists were present to photograph and record the demonstrators. 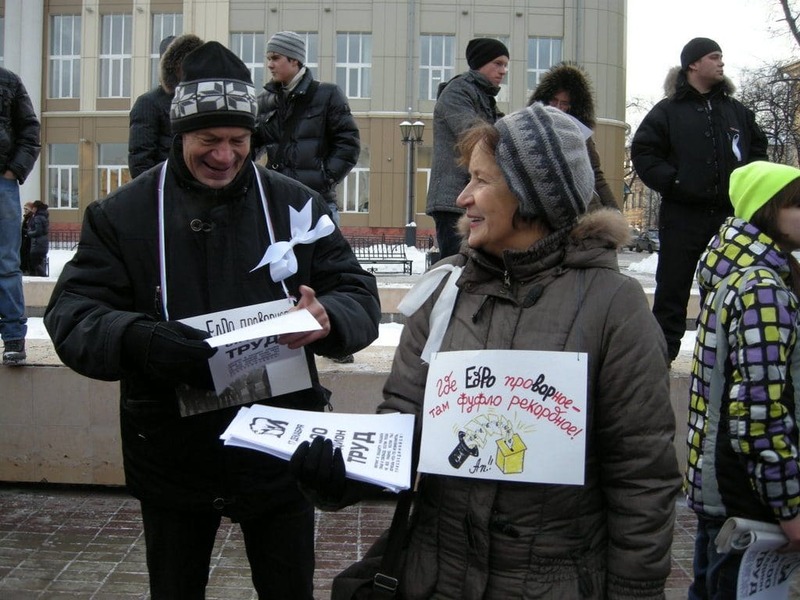 Symbols of the protest included white ribbons, representing the call for fair and honest elections, and a depiction of an angry bear carrying a money bag (a parody of United Russia’s logo). Yabloko had a strong presence at the demonstration, with party organizers in green uniforms helping everything run smoothly and without any police intervention. Some interesting costumes were also present, including a man dressed as Che Guevara, complete with cap and cigar. 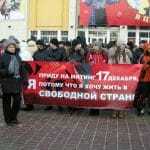 A newsletter, “Siberia without Censorship” was handed out to participants as well as flyers advertising the next demonstration, planned for December 17th at 2pm at Stadium Trud. Find more photographs of the event here. From the widespread protests, one gets the impression that citizens are generally dissatisfied with United Russia and tired of the Putin & Medvedev administration. 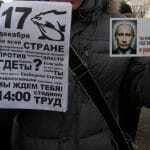 But the fact that United Russia still won a majority of votes across the board puzzles and frustrates these protestors. Asking people in Irkutsk about the elections, I generally hear things like, “there’s no one to vote for” (Не за кого голосовать) and “anything but United Russia,” and many uses of the popular blogger Alexei Navalny’s famous description of United Russia as “the party of swindlers and thieves.” The older people who I talked to seemed to lean more toward the Communist Party and Yabloko, while youth leaned more toward the Liberal Democratic Party of Russia. Advertisement for the next planned protest. Danya Spencer holds a Bachelor of Arts in Foreign Languages – Russian & Chinese from Lewis and Clark University. She served as a Home and Abroad Scholar over the 2011-2012 academic year. Her program combined study abroad in Russia along with an intensive professional internship focusing on translation, research, and writing. She went on to work with NGOs in Russia and America.